Welcome to “the Painted Apron”, a crazy place where there is cooking, painting and creating going on most of the time. I hope to inspire you with recipes and ideas for your own creations and experiments. 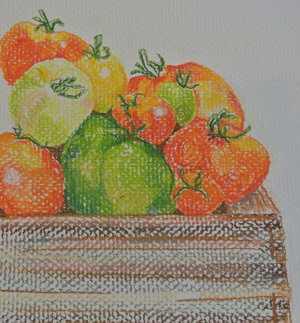 My focus topics will be recipes, gifts, tablescapes, organization, painting and parties. 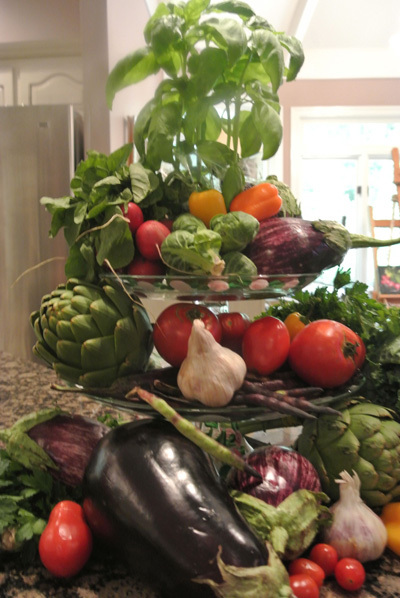 I LOVE LOVE LOVE to use fresh vegetables in centerpieces and tablescapes. My kitchen is neutral with black and white accents. This is a great background for introducing just about any color. My favorite pop is red so when a thoughtful friend brought by some of her beautiful home grown tomatoes I made lots of plans for them. 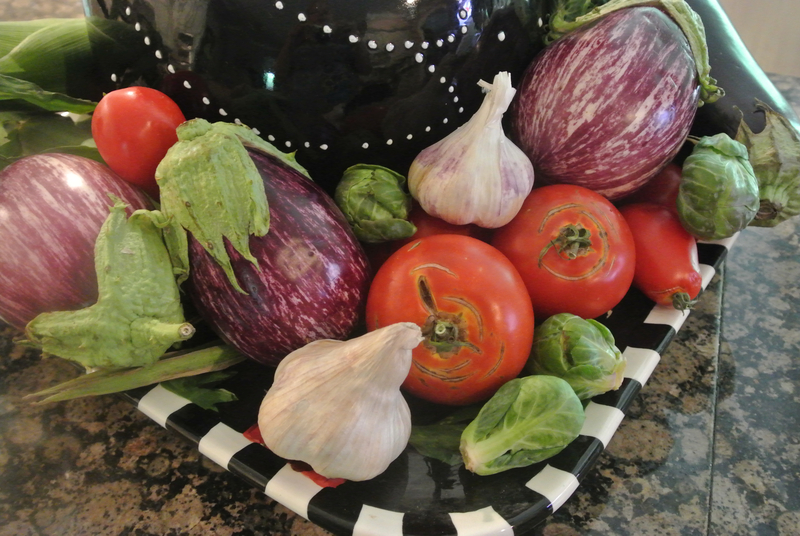 These beauties are currently hanging out on my kitchen island as a centerpiece. I have photographed them, eventually I will paint them and we will definitely eat them! The palette of black, white & red goes beautifully with touches of purple and green. 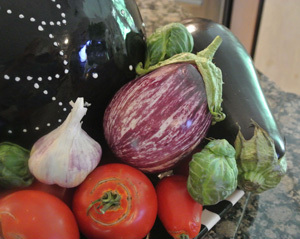 I think I’ll make a tomato pie…no, eggplant parmigiana…..no, pasta primavera…..decisions, decisions! 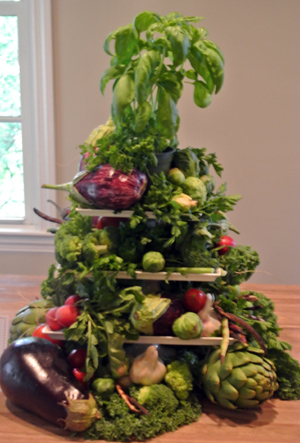 I have these vegetables too, left over from this “vegetable tower” centerpiece I made for a party over the weekend. It was the perfect decoration for a summer party, set in the center of a large buffet table laden with platters of food. I decided to do a mock up at home to make sure I had everything I needed. 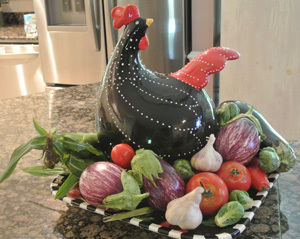 For this centerpiece I added artichokes, pink eyed peas, cilantro, parsley and peppers with a basil plant on top. Here’s what the actual centerpiece looked like. I decided to keep the color pops of red to a minimum so the overall look was mostly green, and would not compete with the actual food being served. I did this about three hours before the party, and radish tops and the parsley got a little wilty, so keep the delicates in the fridge and add them at the last minute. The large kale leaves were a great feature for the base. 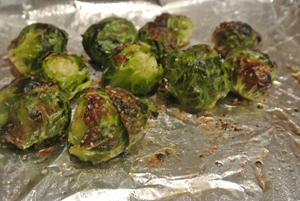 If you aren’t a big fan of brussel sprouts, try these. They are CANDY when prepared this way. So easy, so healthy, so good. BUT, be sure to roast them at 400- I tried a lower temperature once when cooking with a casserole and they did not taste the same. At the lower temperature they tasted and smelled like old cabbage, probably the reason for their unfortunate reputation! Try these roasted at 400 beauties! Hungry Husband even loves them and he refused to eat them as a child. Drizzle with olive oil, season with salt & pepper and roll around pan to coat. 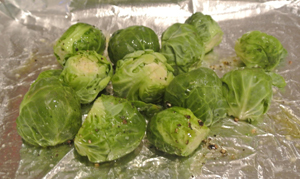 Roast the sprouts in the at 400 degrees for about 30 minutes. Yum! I promise you will LOVE these! 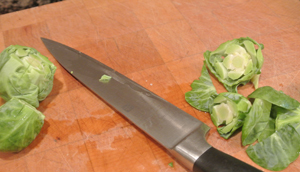 Wash sprouts and cut off end and score with an x. Discard loose outer leaves. 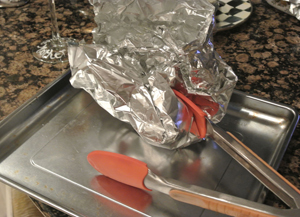 Place on Olive oil sprayed lined foil pan and drizzle with OO. 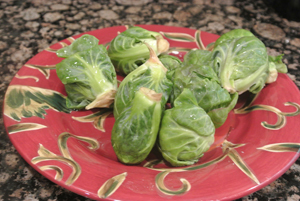 Season and roll sprouts around to coat with oil. Roast for 30 minutes at 400.